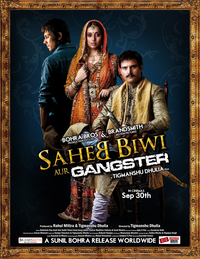 Review Summary: SAHEB BIWI AUR GANGSTER is a well-made film that works for its powerful plot engaging script commanding dialogue and super performances. In this twisted tale, set in rustic, small-town India, all three characters that make up the title are terrifically layered and intriguing. An adaptation of the Guru Dutt classic Sahib Bibi aur Ghulam the film re-works the story against a backdrop of decaying royalty and underworld duplicity. SAHEB BIWI AUR GANGSTER is a well-made film that works for its powerful plot engaging script commanding dialogue and super performances. Even before the movie begins, you get a good feeling about it. Fortunately, it lives up to that intuition. A crackling script, fantastic direction and amazing performances, this movie almost deserves to be called a classic. Better films, one may say. What makes 'Saheb Biwi aur Gangster' special is it's layered narrative. Just when you feel that you have cracked the reason and cause behind a certain scene, there is something new which unfolds that only enhances the film further. So while it seems like a familiar ground being explored when the classic case of 'a woman (Mahie Gill) looking for another man (Randeep Hooda) after being ignored by her husband (Jimmy Sheirgill)' is brought to fore, it turns out there is also a power game being played by all involved. Saheb Biwi Aur Gangster is meant for smart audience that doesn't enter the cinema hall expected crass masala flick in the name of entertainment. It is witty and deserves a watch. very moderately budgeted Saheb Biwi Aur Gangster is a fair entertainer but with a few loose ends in its screenplay. It will do fair business at the box-office.